Robert Huff took pole position in a dramatic final qualifying session of the season. Andy Priaulx took second and Augusto Farfus third. Both SEAT title contenders, Yvan Muller and Gabriele Tarquini, had huge crashes in Q2 and will line up seventh and eighth respectively if their cars can be repaired. Q1 - As expected in such a crucial qualifying, the teams hit the track in groups to benefit from slipstreaming. D'Aste was the first to make a mistake and did so after the Solitude Esses. He hit the wall and his car stayed on the track for the remainder of the session. Meanwhile, Yvan had a spell at the top while Huff was also on the pace. Farfus was sitting tenth before he and Priaulx had a hot lap and the Brazilian took himself to eighth and the Briton to sixth. A final surge by team SEAT saw all five cars in Q2, however Rydell's car suffered engine problems at the end of session and stopped on the track. The session ended in drama as James Thompson smashed into the back of D'Aste's stationary car. He was taken to hospital for check-ups. Zanardi and Larini narrowly missed out on Q2 appearances. Tom Coronel was the fastest Independent taking 13th on the grid followed by rival Porteiro 14th and local man Couto 16th. Q2 - Within five minutes, two of the championship fighters had crashed. Tarquini and Muller were in close contact when they encountered the oil left from Thompson's earlier collision and it sent them spinning. The cars were both too damaged to continue and Muller was also taken to hospital for check-ups. Menu was behind the SEAT duo and also obtained damage. 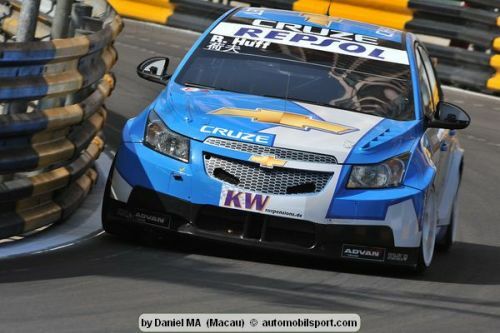 Although the team tried to make the Cruze track-worthy in time he could not clock a lap time. As the night was falling, Huff completed a lap of 2:32.141 that ousted Priaulx and Farfus to second and third, while Gené took fourth ahead of Monteiro and Müller. Qualifying results remain suspended pending the Data Logging System checks and fuel analysis. Check and analysis results will be available tomorrow in the late morning. Priaulx and Farfus claim top-three grid positions for BMW in Macau. BMW Der Weg nach Macau und die Tourenwagen-WM 2009 im Rückblick. BMW feiert zwei Doppelsiege beim WTCC-Gastspiel in Japan. Okayama : What drivers said..